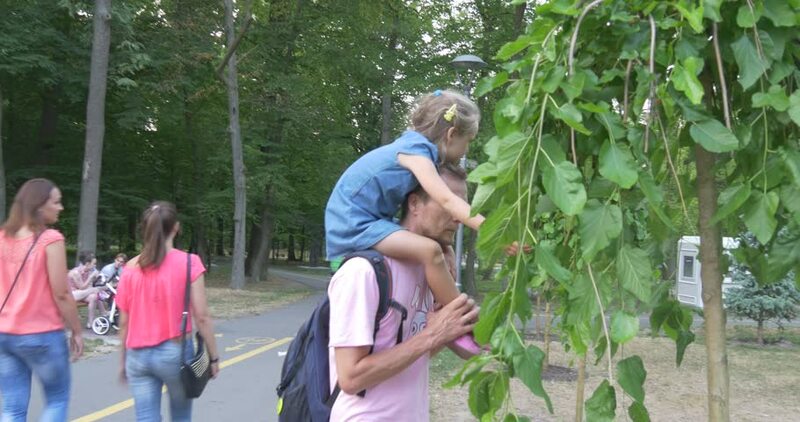 BUCHA/UKRAINE - JUL 19 2015: Father carries his little daughters on his shoulders in park, other people walk nearby, mid-shot, day, Ukraine. hd00:07PORTOROZ, SLOVENIA - 5. MAY 2018 A wedding couple is slowly walking through a park where they're having their wedding photos taken. hd00:13Elderly woman collects pears in the garden. hd00:10Young beautiful girl is sitting on wooden bridge near forest lake and is reading an digital book.